Telescope Casual features a versatile patio furniture collection that consists of a variety of different styles and materials. Since 1903, Telescope Casual has been manufacturing world-class luxury patio furniture that is made in the USA. From their manufacturing plant located in New York, Telescope is constantly improving in the research, development, and engineering process of making quality outdoor furniture. Telescope remains committed to being an industry pioneer by introducing new innovations and products, while preserving their well deserved reputation for high quality furniture. This is the Original Mini-Sun Chaise by Telescope Casual . 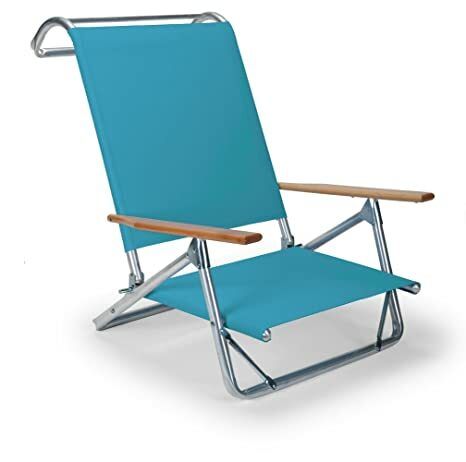 The Original Mini-Sun Chaise beach chair is the hallmark of Telescope beach chair quality. The Mini-Sun Chaise features exclusive support braces provide unparalleled strength and rigidity. 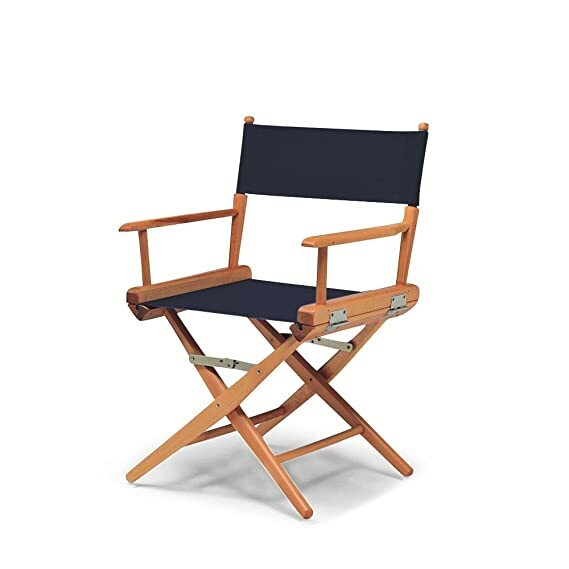 The beach chair features decorative kiln-dried solid hardwood arms that are shaped and hand sanded and then, double coated with heavy-duty polyurethane varnish. The strong 1-inch aluminum frame has been extruded and drawn for extra strength and is assembled using zinc-plated rivets and screws. 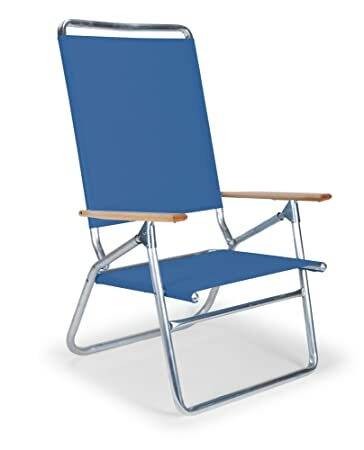 The beach chair fabric is weather resistant and securely attached using zinc plated nails. The additional canopy top and convenient storage side bag options will match the fabric of the chair if purchased separately. Telescope Casual features a versatile patio furniture collection that consists of a variety of different styles and materials. Since 1903, Telescope Casual has been manufacturing world-class luxury patio furniture that is made in the USA. From their manufacturing plant located in New York, Telescope is constantly improving in the research, development and engineering process of making quality outdoor furniture. Telescope remains committed to being an industry pioneer by introducing new innovations and products, while preserving their well deserved reputation for high quality furniture. The Gardenella collection has been a staple collection for Telescope for over 30+ years. Offering an extruded round all aluminum frame design, replaceable slings and simple styling. Both chaises are four position stacking with an arm or armless design. The poolside chair is great for any lounging area. Telescope Casual features a versatile patio furniture collection that consists of a variety of different styles and materials. Since 1903, Telescope Casual has been manufacturing world-class luxury patio furniture that is made in the USA. From their manufacturing plant located in New York, Telescope is constantly improving in the research, development, and engineering process of making quality outdoor furniture. Telescope remains committed to being an industry pioneer by introducing new innovations and products, while preserving their well deserved reputation for high quality furniture. 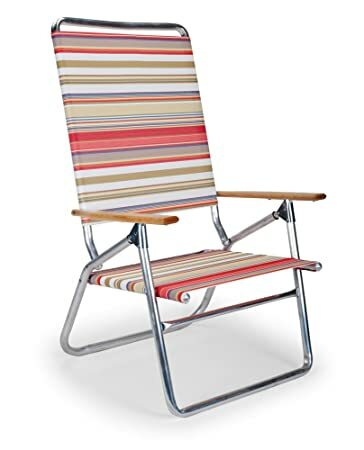 This is the Telescope Casual Light ‘n Easy High Boy Beach Chair . 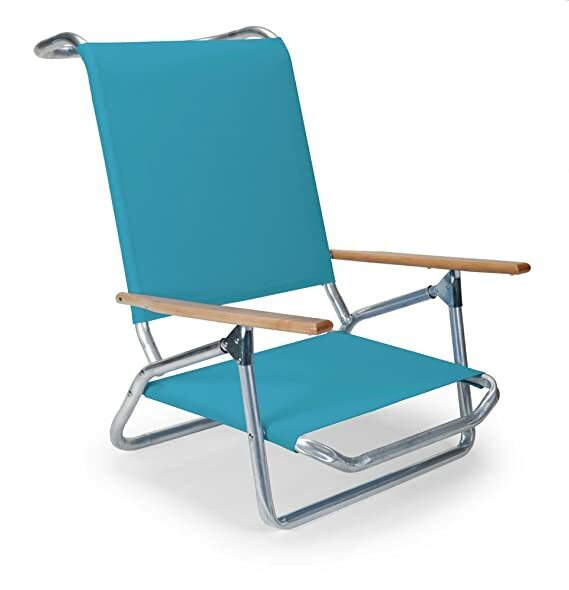 The high boy beach chair features four comfortable recline positions. This beach chair features a higher seat height and taller seat back that makes it easier to get in and out of. 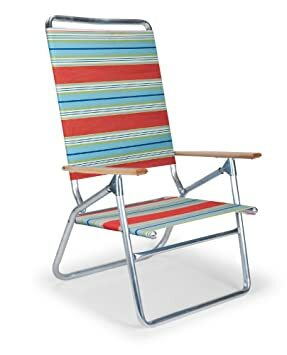 This beach chair is great for tall people or older people due to it’s high boy style. The Light ‘n Easy High Boy Beach Chair features decorative kiln-dried solid hardwood arms that are shaped and hand sanded and then, double coated with heavy-duty polyurethane varnish. The strong 1-inch aluminum frame has been extruded and drawn for extra strength and is assembled using zinc-plated rivets and screws. 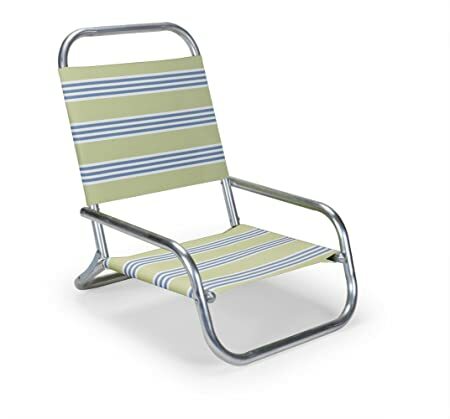 The beach chair fabric is weather resistant and securely attached using zinc plated nails. The additional canopy top and convenient storage side bag options will match the fabric of the chair if purchased separately. Telescope Casual features a versatile patio furniture collection that consists of a variety of different styles and materials. Since 1903, Telescope Casual has been manufacturing world-class luxury patio furniture that is made in the USA. From their manufacturing plant located in New York, Telescope is constantly improving in the research, development, and engineering process of making quality outdoor furniture. Telescope remains committed to being an industry pioneer by introducing new innovations and products, while preserving their well deserved reputation for high quality furniture. This is the Telescope Casual Sun and Sand beach chair. 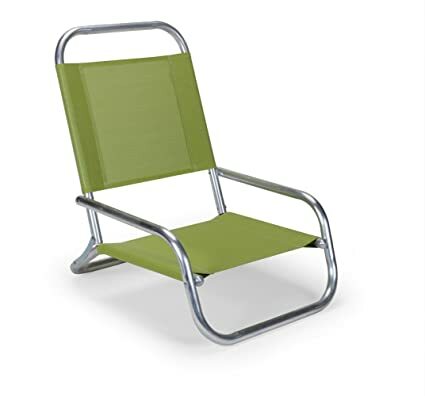 The beach chair features strong 1-inch aluminum frame has been extruded and drawn for extra strength and is assembled using zinc-plated rivets and screws. This chair is simple in design yet it is durable and very comfortable. The fabric is weather resistant and securely attached using a loop-style seat and back. It is so easy to fold up, carry and set up at a camp site or the beach. Telescope Casual features a versatile patio furniture collection that consists of a variety of different styles and materials. Since 1903, Telescope Casual has been manufacturing world-class luxury patio furniture that is made in the USA. From their manufacturing plant located in New York, Telescope is constantly improving in the research, development, and engineering process of making quality outdoor furniture. Telescope remains committed to being an industry pioneer by introducing new innovations and products, while preserving their well deserved reputation for high quality furniture. This is the Telescope Casual Light ‘n Easy Low Boy Beach Chair. The Light n Easy Low Boy beach chair features four comfortable recline positions. 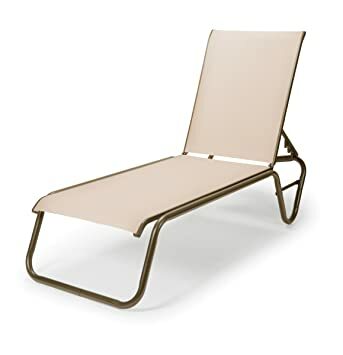 The Light ‘n Easy Low Boy Beach Chair features decorative kiln-dried solid hardwood arms that are shaped and hand sanded and then, double coated with heavy-duty polyurethane varnish. The strong 1-inch aluminum frame has been extruded and drawn for extra strength and is assembled using zinc-plated rivets and screws. 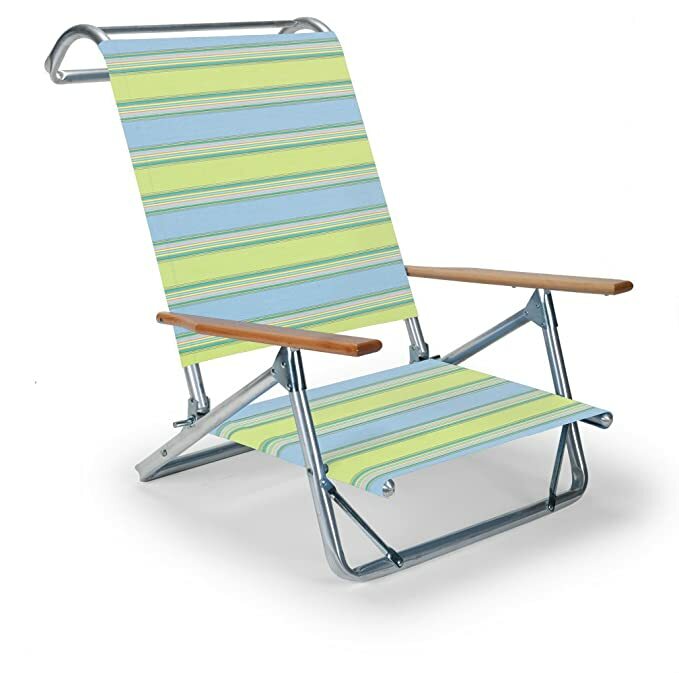 The beach chair fabric is weather resistant and securely attached using zinc plated nails. The additional canopy top and convenient storage side bag options will match the fabric of the chair if purchased separately.